Much like any business relationship, when Australian-owned Bus & Coach International (BCI) joined forces with machinery heavyweight Weichai Power and their heavy-duty vehicle arm Yaxing, they knew it must be both mutually beneficial and built on a strong relationship. In the bus industry, innovating and cost are imperative given its competitive nature. The strategic alliance draws some major benefits for both parties, from the technical expertise of BCI to the economies of scale of their Chinese partner. A standout production technique on the BCI factory line is side panel stretching machinery. This robust equipment always draws attention and approval from bus operators touring the production facility. 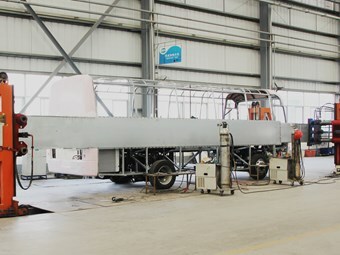 BCI Technical Director Boyd Denning shares that, "the equipment is employed for all steel and fibreglass stretch panels to ensure they are true and straight when fitted." "The hydraulic powered stretch panel machine has up to a 10 ton pulling force. This is infinitely variable for different size and types of panels, the workshop has a detailed list of the correct pulling force for each panel to ensure the optimum fit". The panel stretching technique ensures wave free side panels. It affords a flawless finish for the vehicles. "I am not aware of any other body builder in Australia that has this technology, Denning says. Denning is a passionate body builder and proud of the precision techniques he implements on the factory floor, explaining "another important point of difference is that we use a laser to level our chassis before fitting the bodies. "We follow all standard Australian manufacturing processes and pay particular attention to the under body painting and sealing." BCI takes great care in offering vehicles that represent quality and value for money. An approach resulting in the Australian owned company skyrocketing to become a market leader from 2007, thus appealing to foreign investment. BCI CEO Ivan Furlanetto says: "All relationships need to be maintained and we have developed a tight partnership. "Our China connection has evolved and matured over seven years. It takes time to appreciate ones requirement in a different market and we have really learned a lot from each other." Furlanetto says China is a country going through immense development, and striving to improve itself. "I’m proud to be a part of this process, the globalization of the East and the West, and joining together to build a world class product."